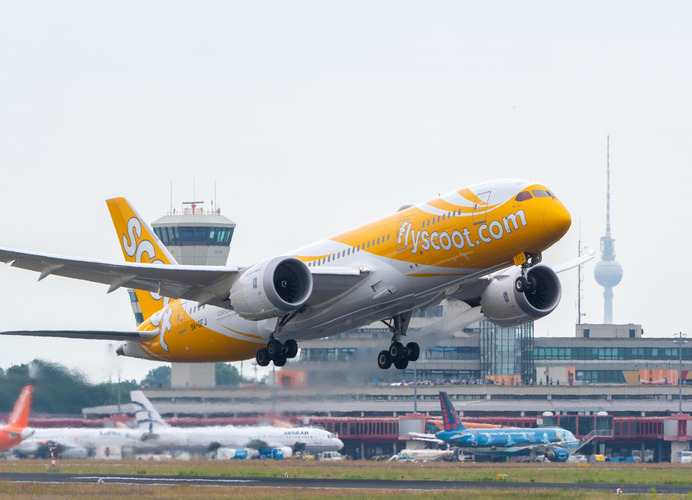 Scoot now flies to Berlin and will link the capital with Singapore in Asia. The direct flight will operate four times a week. Scoot is a low-cost daughter company of Singapore Airlines (SIA) Group and was voted as the best low-cost-airline in the Asia-Pacific region for the fourth year in a row. Berlin is Scoot’s third long-haul connection after Athens (Greece) and Honolulu (USA). Flight TR734 took off from Singapore-Changi (SIN) at 00:25 local time and was greeted in Berlin with a water fountain at 07:20 local time on June 20. The wide-body aircraft, a Boeing 787 Dreamliner, christened „Bo-Jio“, accommodated 311 passengers at 95% capacity. The passengers came from Singapore, Indonesia and Australia. Approximately half of them were between 18 and 35 years old. Scoot, known for their unique and cheerful company culture, has made a name for themselves with neon parties, band performances and even a wedding on board their flights. In line with Berlin’s reputation as Europe’s party capital, the passengers were invited to a dance party with electronic music and prize contests.